Last week’s candle was interesting, not because it has given us a clear signal, but more because it has provided the first sign ( a small difference I know, but important nevertheless). Firstly the closing price on the week closed above both the 9 day and 14 day moving averages. Secondly the price fall was reversed during the week, with the close above the previous week’s close. 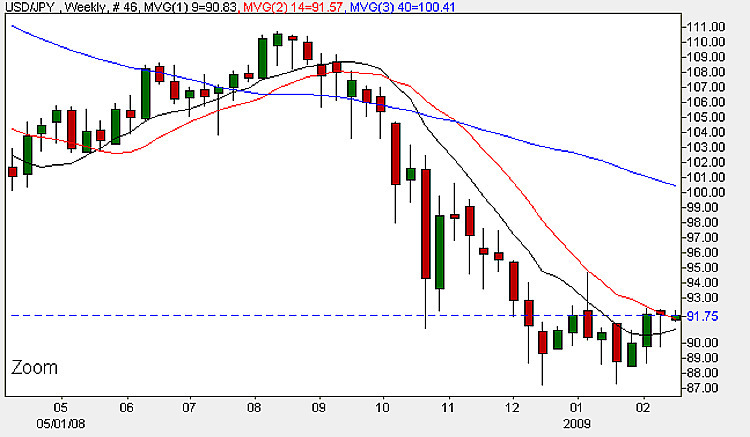 Finally the lowest price on the week failed to penetrate below the previous week’s low. Whilst we never trade on the strength of one candle, all this would suggest that we are perhaps seeing the first in a series of higher prices for the yen to dollar currency pair, with a possible move back to the first resistance area at $93.50. As this is a holiday in the US today, I would suggest waiting until tomorrow for any signals in the daily chart in order to look for an entry point for the trade. On the fundamental front we have a tentative meeting of the Bank of Japan scheduled for Thursday this week, and remains tentative until the press conference begins. This is one of the main ways that the Bank of Japan uses to communicate with investors regarding monetary policy. It covers the factors that affected the most recent interest rate decision, the overall economic outlook, inflation, and clues regarding future monetary policy, and is therefore eagerly awaited by the markets. All the other news for the dollar yen this week is in the US, and details can be found on the euro to dollar site. The short term outlook is sideways, the medium and long term is bullish.